Reminiscent of the work of American writers J.D. 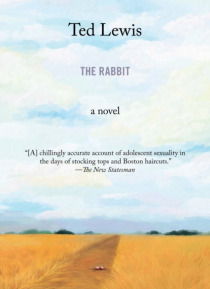 Salinger and Henry Roth, The Rabbit is Ted Lewis's (Get Carter) most autobiographical work and an emotionally complex portrait of what it was to come of age in post-war England It is the late 1950s and Victor Graves is an art school student whose father manages a rock quarry not far from their home in Lincolnshire. He is the apple of his mother's ey… e, but Victor's dad thinks his son takes for granted the life he provides.He setsVictor up to work in the quarry for the summer holiday, breaking rocks to harvest flint. It isin the quarrythat the thin, awkward Victor meets Clacker. Tattooed and sinewy, Clacker swings the rock hammer all day and by night kits out in Teddy boy trappings for long bouts of carousing. For Victor he epitomizes masculinity. Yet the always glib Clacker refuses to accept Victor. Desperate to prove himself, the sensitive Victor begins to spend more time in pubs and picking fights. Everything begins to unravel after a disturbing incident at work sends Victor on a dangerous downward spiral. Though known best as one of Britain's most important crime writers, Ted Lewis had the soul of a poet. This powerfully emotional novel is a moving portrait of small town lifethe pubs and the people, the workaday lifeas seen by a young man navigating through the cultural and sexual confusion of 1950s England.